WB: MCF7, Jurkat, A431, C2C12, NIH/3T3 and HeLa whole cell lysate (ab150035), mouse heart and rat brain tissue lysate. ICC/IF: MCF7 cells. IP: HeLa whole cell lysate (ab150035). Our Abpromise guarantee covers the use of ab155102 in the following tested applications. WB 1/1000 - 1/10000. Predicted molecular weight: 47 kDa.Can be blocked with Human ENO1 peptide (ab226769). MBP1 binds to the myc promoter and acts as a transcriptional repressor. May be a tumor suppressor. Nucleus and Cytoplasm. Cell membrane. Cytoplasm > myofibril > sarcomere > M line. Can translocate to the plasma membrane in either the homodimeric (alpha/alpha) or heterodimeric (alpha/gamma) form. ENO1 is localized to the M line. Immunocytochemistry/Immunofluorescence analysis of MCF-7 cells labelling ENO1 with purified ab155102 at 1/60. Cells were fixed with 4% paraformaldehyde and permeabilized with 0.1% Triton X-100. ab150077, an Alexa Fluor® 488-conjugated goat anti-rabbit IgG (1/1000) was used as the secondary antibody. DAPI (blue) was used as the nuclear counterstain. ab7291, a mouse anti-tubulin (1/1000) and ab150120, an Alexa Fluor® 594-conjugated goat anti-mouse IgG (1/1000) were also used. Control 1: primary antibody (1/60) and secondary antibody, ab150120, an Alexa Fluor® 594-conjugated goat anti-mouse IgG (1/1000). Flow Cytometry analysis of MCF-7 (human breast carcinoma) cells labeling ENO1 with purified ab155102 at 1/20 dilution(10ug/ml) (red). Cells were fixed with 4% paraformaldehyde and permeabilised with 90% methanol. A Goat anti rabbit IgG (Alexa Fluor® 488) (1/2000 dilution) was used as the secondary antibody. Rabbit monoclonal IgG (Black) was used as the isotype control, cells without incubation with primary antibody and secondary antibody (Blue) were used as the unlabeled control. Immunocytochemistry/Immunofluorescence analysis of MCF7 cells labelling ENO1 with unpurified ab155102 at a dilution of 1/100. 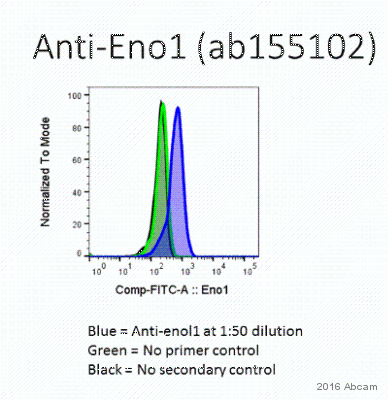 ab155102 (purified) at 1/20 immunoprecipitating ENO1 in HeLa whole cell lysate. Lane 2 (+): ab155102 + HeLa whole cell lysate. Lane 3 (-): Rabbit monoclonal IgG (ab172730) instead of ab155102 in HeLa whole cell lysate. Publishing research using ab155102? Please let us know so that we can cite the reference in this datasheet. 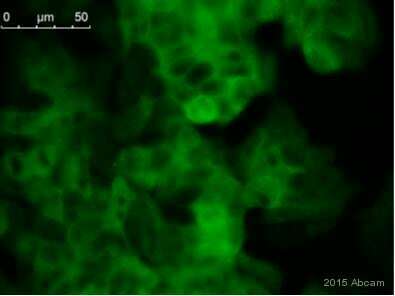 Cell harvesting/tissue preparation method: Harvested spleen from B6 mouse, stimulated with antii-CD + anti-CD28 in vitro for two days, and performed intracellular staining for flow cytometry.